Please note that the posts in this blog are in reverse order, so the newest posts are at the top and the oldest posts are at the bottom. You can enlarge most of the photos by clicking on them. I was very pleased to receive an email yesterday from Tony in Wigan. He kindly offered to bring his CB250NA over to my house and allow me to swap parts from his to mine in order to help identify the problem. How good is that??? We're gonna meet sometime next week and although I probably won't remove anything from his bike, I will most definitely take some electrical readings for comparison. Ali Munir's comment has been deleted because advertising crap is not allowed. Current Location : Horwich, Bolton, UK. 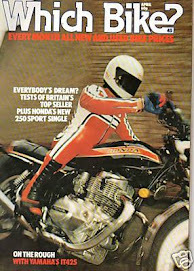 Way, way back in August 1980, I was working as a young steel-erector in Newcastle Upon Tyne and around the corner from where I worked was "Ken's Motorcycles" on the West Road. In the window was a brand new CB250N Superdream in shiny black - and I wanted it! So I got got the brochure (shown below), begged my future father in law to act as guarantor and signed on the £820 dotted line. I loved that bike - it got me back and forth between Bolton and Newcastle with no problems or hiccups and lots of fun. From memory, it did something like 60 miles per gallon and could burn off most cars. What else does a young lad want? Anyway, 28 years later, I decided to get another one and refurbish it over the winter months. I've done similar projects in the past and really enjoyed them, so I'm hoping that this one turns out as well as the others. Having said that, this project will be a REFURB as opposed to a rebuild. The donor-bike looked to be in pretty good shape at first glance, but as usual, it all turns pear-shaped when you remove your rose-tinted glasses and start to see what's REALLY there! The first thing that I want to do, is spend a little time finding out whether or not the engine needs a rebuild. If it doesn't really need it, so much the better. If it does need doing, then there'll be a significant delay as I spend time clearing out the garage to give me a lot more space. I estimate that this project will take 3 or 4 months to complete but due to other interests/hobbies, it may go longer. So, I'll start off with a few photos of the bike in its current condition and then log the progress of the refurb as I go along. Please feel free to comment or offer advice. Hope you enjoy! 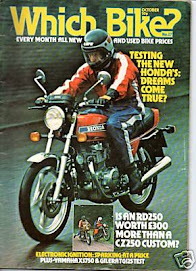 SEE ALSO... HONDA CB450 K1. SUBSCRIBE TO THIS BLOG - Your email address will NOT be passed on.